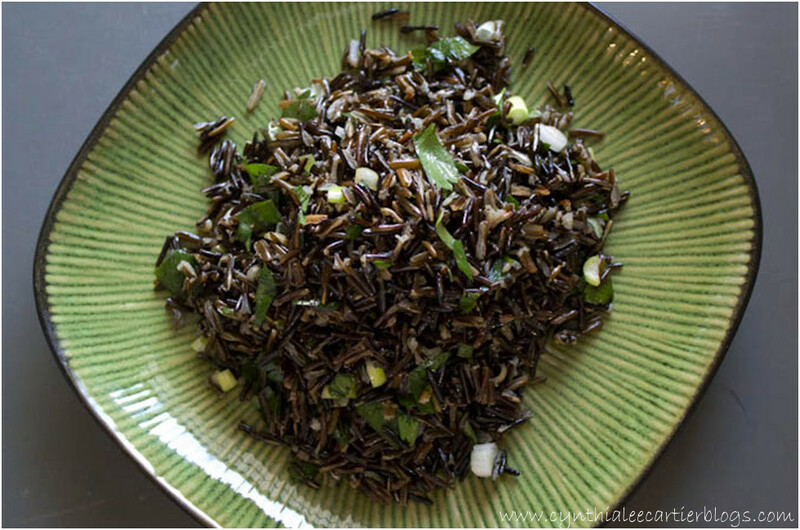 This Herbed Wild Rice recipe is easy to make and has great texture and flavor. I like the chewiness of wild rice, which works well as the only grain in a dish, but I also like to mix it with other rices and add it to soup recipes. Once cooked, wild rice can be tossed with veggies, nuts, dried fruit, spices and dressings to make a chewy and filling side dish or a main dish served with a side salad. Wild rice is richer in protein than white rice and most other grains. It contains more vitamin B-3 (otherwise known as Niacin) than brown rice and is a very good source of other B vitamins such as calcium and potassium. And like all grains, it’s a good source of fiber. Rinse the rice well under cold, running water. Bring the 3 cups of water to a boil in a heavy, medium to large saucepan. Add rice then return to a boil and stir. Reduce heat, cover and simmer for 50-60 minutes or just until kernels puff open. For a chewier texture, cook for less time. When rice is cooked, toss with onions, parsley, spices and seasonings. Best served warm.